Bergen County Real Estate! Northern Valley Real Estate! Very Custom Home with wonderful surprises! Hidden Away and Wonderful! 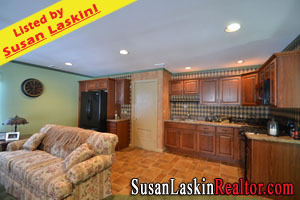 439 Tappan Rd in Northvale ($468,950!) is a Young (1991) and beautiful Raised Ranch with Extended Family Potential! Circular paver driveway....Leaded Glass front door leads to spacious Entry Foyer..Large Family Room with Summer Kitchen, recessed lighting, and doors to Covered Patio with Skylight and 2 ceiling fans..4th Bedroom and full Bath at this level as well. Click here for more photos & information! Looking for more Bergen County Real Estate? Browse through my Feature Homes! Some incredible listings across the wonderful Bergen County towns!